Kelly and Chris wanted to have the perfect Florida destination wedding. 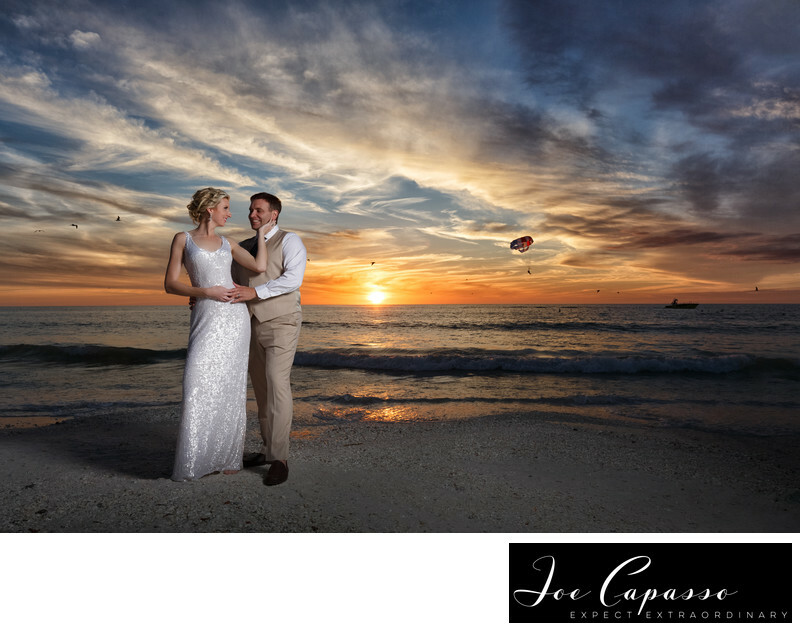 We think this amazing sunset photo sums up their perfect Florida wedding at the Marco Island Marriott! We worked with Kelly and Chris to come up with the perfect wedding timeline so we would be able to capture all of the key moments throughout their beach wedding. When couples want wedding sunset photos we usually recommend to have your wedding ceremony end an hour and a half before sunset. This allows enough time for family photography, and at least an hour for romantic wedding photography around your particular venue -- along with amazing sunset photos such as this one! This photo was taken on the beach at the Marco Island Marriott. Marco Island is just a few minutes outside of Naples, Florida. The Marco Island Marriott is one of the most popular places to hold destination weddings in the Marco Island and Naples area. Location: Marco Island Marriott, Florida .